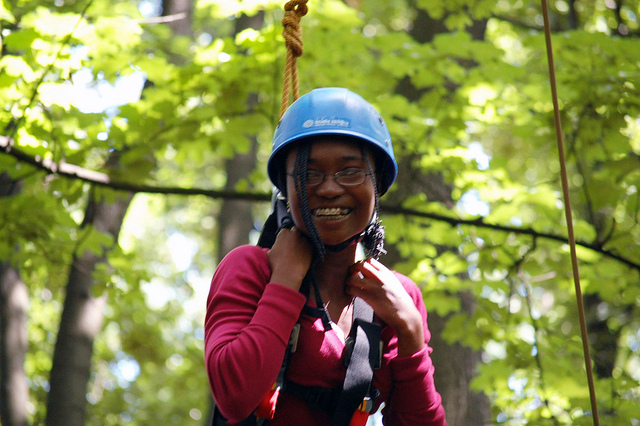 Anita smiles proudly when completing a challenging high ropes course during her exchange. Anita Annan learned about the Youth Leadership Program through her school. "I honestly didn't even think I would get in so I didn't want to get my hopes up," says Anita. "Then I made it to the interviews... after that I wanted it so bad. I'm really grateful my school told me about it because it remains one of the most defining moments of my life." Anita had no idea what to expect when it came to meeting her host family, but she kept an open mind. "I was terrified to meet my host family," says Anita. "I thought what if they don't like me? I had a lot of negative thoughts of what could go wrong. When I met them it was a huge relief! They were really curious about me and my cultural background." "My host sister and I shared a lot of stories about ourselves. My host mother didn't speak English, but we spoke through gestures and though it was awkward at times, during those two weeks I really felt like they were my family." Through Anita's program she looked at the lives of the Roma communities in Central Europe and learned their perspective on leadership and community development. "I knew very little about the [people of] Roma," says Anita. "I had never even heard the word, "Roma." People told me that the Roma are Gypsies, but even that word held little meaning for me, so I'm so glad I got to learn about them." Youth Leadership Programs take participants like Anita on a deeply personal and sometimes rigorous physical journey. During her exchange trip, Anita took time to develop her leadership skills. "One leadership development activity that affected me was Arrested Motion/Forward Motion," says Anita. "The activity has to do with the way a person thinks&ndsh;arrested motion can hinder reason, while forward motion can push a person past emotional roadblocks like anger." "It is a choice to think one way or the other and it really made me evaluate the way I make choices. I gained a lot of psychological fortitude through that activity... You have to be willing to give 100% of yourself to fully learn about others, and in the process learn about yourself." "I often think about how worked I felt during my program – not necessarily physically, but mentally. I was always reflecting deeply about the activities we did, and how I could build on them to become better and making my surroundings better." "My experience helped me to approach difficult situations with perspective and objectivity. When I'm mad at someone, I will think of what I want to say, and try to understand where the other person was coming from. Perspective in difficult situations has improved many of my relations with people, and saved some as well."